Virtual Private Cloud (VPC) enables you to create private, isolated virtual networks. You can configure IP address ranges, subnets, and security groups, assign Elastic IP (EIP) addresses, and allocate bandwidth in a VPC. Private networks on the cloud are completely isolated. You can create Elastic Cloud Servers (ECSs) that are in different availability zones, in the same VPC. Self-service network management frees you from routine network configurations and allows flexible network deployment.  Dynamic BGP network connections enable seamless high-speed access to services on the cloud. VPC peering enables interconnection between VPCs. Leverage the VPC service to build private networks, assign EIPs for network access, and configure and deploy services. Flexibly define networks, configure subnets on demand, and assign EIPs. Configure access control policies to control network traffic in and out of subnets. Leverage the VPC service to build private networks and use Elastic Load Balance (ELB) to provide web services that can be concurrently accessed by a large number of users. ELB is used together with VPCs to process concurrent connection requests, ensuring reliable service connections. Auto Scaling (AS) automatically scales resources, ensuring service availability in the event of traffic spikes. With Direct Connect and VPN, you can build a hybrid cloud by connecting VPCs to your local data center and migrating data to HUAWEI CLOUD. Direct Connect provides secure, dedicated, high-speed network connections; VPNs offer secure IPsec communication tunnels and are cost-effective. Supports two-way migration of user services and data and availability of user services and data at both locations. VPCs are completely isolated from each other and can be customized to meet specific requirements. Dynamic BGP connections enable high-speed network access. HUAWEI CLOUD VPC offers advanced security features to control access to resources in VPCs, providing multiple layers of security. Achieves complete logical isolation of VPCs using Virtual Extensible LAN (VXLAN). Allows subnets, IP address ranges, and DHCP settings to be fully configurable. Networks to multiple Internet service providers (ISPs) enable real-time failover and ensure high reliability. Charges are based on BGP connection traffic. You pay only for what you use. Controls access to cloud servers by filtering inbound and outbound network traffic based on ports and protocols, including TCP, UDP, and ICMP. Uses the blacklist and whitelist to control network traffic in and out of subnets, adding an additional layer of security to VPCs. Custom routes and VPC peering allow more flexible routing control among and within VPCs. VPN and Direct Connect enable seamless extension of services in local data centers to HUAWEI CLOUD. Supports creation of route tables and custom routes to control packet forwarding within VPCs. Supports private IP addresses for routing traffic between any two VPCs. Establishes IPsec communication tunnels to securely connect local data centers with VPCs. Provides high-speed, stable, and dedicated network connections from local data centers to HUAWEI CLOUD. Allows you to send HTTP or HTTPS requests to make API calls to use VPCs. Describes the regions and service endpoints available on HUAWEI CLOUD.